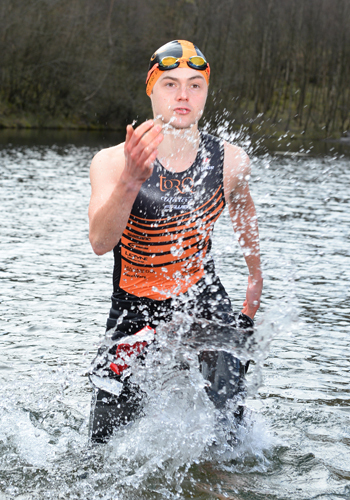 Alex Lawton: The season and summer seems to be flying by and after a good run of results and winning the thing last year, I was hoping that the 4th race in 5 weekends at the North West Sprint Champs would be another. 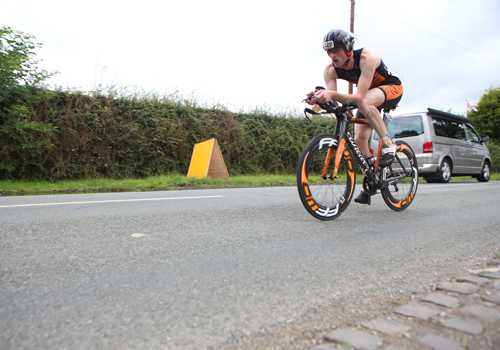 The race is Manchester Tri Clubs annual event and is always well-run and attracts some good age group racers. After the National Sprint Champs the previous weekend, I felt good and able to get 3-4 days good training in between the races, so not quite the typical week going into a race even if it is ‘just a sprint’. After a grim start to the day, things had brightened up for us in the last wave of the day. There were some particularly fast swimmers in the wave and I was disappointed not to tag on the back of this pack. Instead, like most of the other races this year, I ended up swimming by myself and missing the opportunity to take a draft. Coming out 20 or so seconds down, I was confident of moving up the field, as per the norm! Onto the bike and the good old time trial, the ‘race of truth’, man and bike against the clock, or that’s how it should be? As the gap closed, I could see up ahead that a group of 3-4 of those up ahead decided to form their own chain gang and benefit from some drafting. As this is against the rules, it was disappointing to see to say the least! It took longer than usual and a hell of a lot more effort to catch the group and move past them. The problem was that they then sat on my wheel for a bit of a breather before coming past again. Eventually the motorbike referee pulled up alongside the group and I was able to pull away without them gaining a free ride. Soon I was into the 5k run and I moved into 1st in our wave, but as ever, I had no idea how fast those starting earlier had been so couldn’t ease off. After pushing hard on the bike, the run felt hard and the legs felt heavier than usual. Thank god it was only 5k! I was properly spent by the end and crashed to the floor where it felt like an age for the HR to drop, which isn’t the norm for me, but if the course measurement was accurate a 16:04 5k would probably be why? Shortly after finishing, I got the good news that I’d won the race, whilst fellow TORQ teammate Hamish had finished 3rd to round off a great day for the team. Next up is probably the British Standard Distance Champs on the 10th August, one of the most significant races of the year and one which is still the ‘monkey on my back’ after last years mishap. Hamish Shaw: Back in 2012 I took the title. Last year I finished in 5th place with a time of 1:04:54 and I was wanting to better this year. I woke to find rain falling from the sky and wet roads. I was glad that I had been around the course a few times and taken the corners on the bike at speed, so I knew how hard I could take them and what lines to take to dodge the worst of the potholes. By the time I arrived at the venue, the rain had stopped, but the roads were still wet. Boundary has a split transition, so I dropped my run shoes in T2 in a plastic bag just in case it rained again. 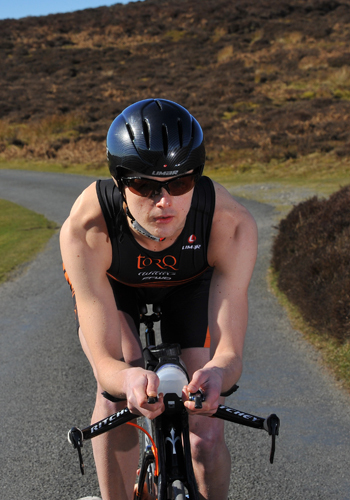 When I got to T1, I bumped into fellow TORQ athlete, Alex Lawton. We were racked next to each other, but thankfull with bikes facing in opposite directions so that we couldn’t pick up the wrong bike in T1. 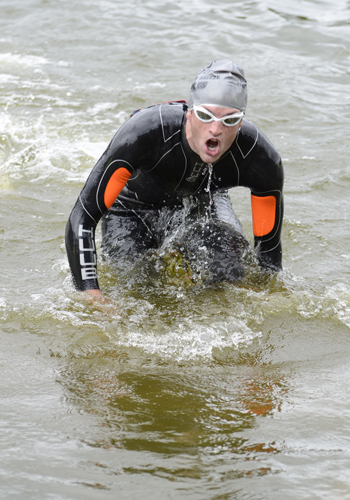 The overnight rain had caused the lake temperature to drop, so it was deemed a wetsuit swim. In T1 I had a little slip over on the wet grass, but didn’t lose focus and exited T1 in a time of 9:23 including the 750m swim. It took a little bit of time to get settled into a rhythm on the bike, but soon I was catching the two in front and I gained the most distance on them on the corners, the bonus of practicing them beforehand. About three quarters of the way through the bike, Alex came past with a couple others following him. I hung back 15m, out of the draft zone, and tried to keep them within touching distance. I entered T2 about 30 seconds behind Alex, the lead rider. I had a quick transition and managed to leapfrog another athlete, Simon Parker, and I started running with about a 10 second advantage over Simon. I was running in 4th place. The run was a two loop out and back, so I could see Alex gaining distance on the field and heading towards the victory. Simon was closing up on me and at the start of the second lap, just before he got on my shoulder, I put an effort in which dropped him. I managed to put some distance between myself and Simon in the second half of the run and crossed the line in 4th place. One of the finishers in front of me had picked up a drafting penalty on the bike which promoted me up to 3rd place overall and 2nd in Age Group. I finished with a total time of 1:03:00 knocking almost two minutes off my time from last year, so all in all a good result. 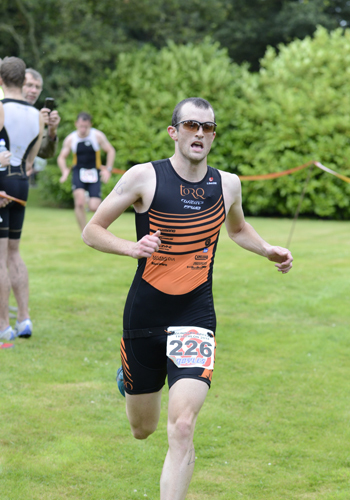 Well done to Alex who took the victory meaning with me in third, there were two TORQ athletes on the podium. My next race is Eirias Middle Distance on 9th August, a cracking race based at Colwyn Bay in North Wales. I have a trip to the Commonwealth Games to look forward to before then though! Plenty of good sport to watch!